If you're looking for the safest bet of what to see at Stratford this summer, you need look no further than "Present Laughter". Noel Coward's sparkling 1942 comedy is given a gorgeous production played by an excellent cast. Director and star Brian Bedford emphasizes the play's abundance of wit, and while there is more to find in the play than he does, the high calibre of the performances makes for a pleasant evening of light amusement. West End star Garry Essendine, all too aware he is ageing, is besieged with people obsessed with him. He's so charming he just can't say no to anybody leaving his devoted secretary Monica and his estranged wife Liz to sort everything out. One problem is Daphne, an upper-class debutante, who, claiming she had forgotten her latch-key, has spent the night in his flat. Another is the would-be author Roland Maule, who needs to be near Garry to work out problems in his own psyche. The most dangerous, though, is Joanna Lyppiatt, whose machinations could ruin the Garry circle of friends and producers and jeopardize his upcoming theatrical tour of Africa. Married to one producer, Hugo, she is having an affair with another, Morris Dixon, and soon sets her sights on Garry. 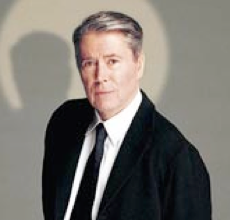 It is poignant and brave of Brian Bedford, himself an ageing star, to be playing Garry Essendine, particularly since he is too old for the role. Noel Coward wrote the role for himself when he was 39 contemplating the big 4-0, while Bedford is more than 25 years older. This does make a difference. Garry's obsession with growing old while in his thirties shows how vain and egocentric he is. When it is more likely old age he faces, a major source of humour and a key to Garry's character is lost. Bedford also misses two other aspects of Garry's character. We hear repeatedly that Garry is "always acting", yet Bedford plays him as if he were always being himself. Unlike Juan Chioran in Soulpepper's production in 2001, Bedford does not distinguish between Garry being himself (whatever that may be) and Garry playing a role (as he often does). Thus, the play loses a sense of depth that ties in with the frequent allusions to "Peer Gynt", i.e. that people may not have a self beneath all the layers of masks they present to the world. The other part of Garry's character is his childishness. Bedford admits in the programme that he has heavily cut the text. One of these cuts is Monica's comforting Garry like a mother after he throws a tantrum. This may make the character more likeable, but is also softens Coward's critique not just of Garry but of all people, theatre people in particular, as merely grown-up children. That Bedford still succeeds in the role is due entirely to his unerring sense of timing and ironic delivery. Bedford's cutting changes the relationships of the other characters. In the original, it is the motherly Monica, Garry's secretary, whose guidance is essential to Garry's survival. Bedford, in eliminating all reference to Garry's childishness has also truncated Monica's part so that she is left with entering, saying a few choice remarks and exiting, while Garry's wife Liz, by default becomes the dominate female of Garry's harem. It is luxury casting indeed to have Seana McKenna play this diminished Monica, but she does have the presence, the withering glare, the pursed expression to help restore some weight to the part. Domini Blythe is wonderful as Liz, exuding all the charm, grace and sparkle the character should have. Sara Botsford, returning to Stratford after an absence of 30 years, exudes feline sensuality and power as the predatory Joanna. Tim MacDonald makes the cryptohomosexual Roland a hilarious portrait of a mentally unbalanced fan. Michelle Giroux is quite funny for two acts Garry's latest conquest, Daphne, but unaccountably in Act 3 she drops the high-pitched squeal and high-born accent she had been using as if she were a different character. In smaller roles, Raymond O'Neill and Shane Carty are rather too generic as Garry's producer friends Hugo and Morris. Brian Tree is in top comic form as Garry's dapper valet, Fred as is the hilariously deadpan Patricia Collins as Garry's Swedish spiritualist maid Miss Erikson, though it would help if she adopted the accent of some known Scandinavian country. Lally Cadeau is suitably grand in the cameo role of Daphne's mother, Lady Saltburn. The action takes place in the elegant two-story high Art Deco apartment Michael Yeargan has designed. Catherine Zuber's stunning costumes makes 1930's fashion plates of all the characters except Miss Erikson and Roland Maule. But there are oversights. Would a valet own a tux much less wear one to the Tottenham Court Road? If Monica is so repressed why does she wear low-cut red blouses? All is lit by Michael J. Whitfield, who masterfully captures the subtle effects of the changing times of day as seen through the set's massive floor-to-ceiling window. To set the tone, Don Horsburgh has compiled recordings of salon music of the period played before and after the show and during the intermissions. Indeed, the calibre of the whole production is so high that on exiting one is surprised to find oneself in downtown Stratford instead of London or New York. Only those who know the play and its original dynamics will have a problem with Bedford's rejigging of the text. For everyone else this is the most refreshing two hours of theatre to be had in town this year. Photo: Brian Bedford. ©2003 Stratford Festival.